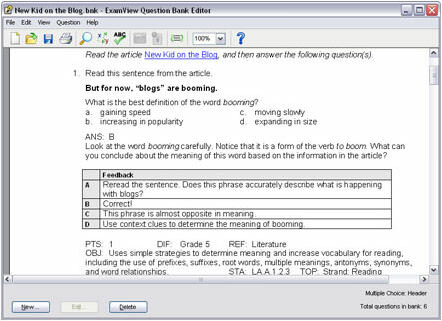 The tst file extension is used by ExamView, an assessment-and-content software from eInstruction available for Microsoft Windows operating system. The tst file contains test created and saved in the program. The ExamView Learning Series is a collection of unique, high-quality questions that can be used for daily monitoring of student achievement and progress in the classroom. Use ExamView to open *.tst test files. ExamView is may be able to export *.tst files to other formats. Programs supporting the exension tst on the main platforms Windows, Mac, Linux or mobile. Click on the link to get more information about ExamView for open tst file action. Programs supporting the exension tst on the main platforms Windows, Mac, Linux or mobile. Click on the link to get more information about ExamView for edit tst file action. Programs supporting the exension tst on the main platforms Windows, Mac, Linux or mobile. Click on the link to get more information about ExamView for create tst file action.